Bass that are feeding. Many times in the fall of the year at Lake of the Ozarks you can see the exploding on the top of the water as they feed on schooling shad. Person fishing with a rod and reel. Tangle of line on a baitcasting reel. Not much fun. Food, or some substitute, used to attract fish and entice them to strike your hook. "Bait" may refer to an artificial lure or live bait. There are many popular baits specific to Lake of the Ozarks. Small fish often eaten by larger predatory game fish. Lake of the Ozarks primary bait fish for bass is Gizzard shad. Circular areas in the lake bottom that bass and other fish clear out in which to lay their eggs during the spawn. "The bass are on the beds" refers to the fish actively spawning. Many Lake of the Ozarks anglers target bass on beds. One of the largest amateur bass fishing tournaments in the nation hosted by Midwest Fish Tournaments in the spring and fall of the year at Lake of the Ozarks. When a bass eats or touches bait so that the fisherman feels it. Trees or sunken brush sunken to attract bass as cover. MDOC has sank numerous brush piles in the Niangua, Glaize and Gravois Arms of Lake of the Ozarks. Many residential docks have brush piles positioned by property owner. Topwater bait with large, propeller-type blades that churn the water during retrieve. Comprised of a leadhead, rigid hook, and wire that supports one or more blades.With the many thousands of docks at Lake of the Ozarks, the buzzbait is an excellent choice on shaded sides of the docks. A style of terminal tackle normally used to keep a lure a foot or two (or more) off the bottom. This is most commonly used with a plastic worm, but is also used with floating crankbaits and other lures as well. A barrel slip sinker of 1/2- to 1-ounce is first slipped on the line and then a swivel is tied to the end of the line. A piece of line 18 to 30 inches long is then tied to the other end of the swivel and a hook or lure is tied to the end of this piece line. Rigged Texas style (weedless with the hook buried in the body of the bait), the combination is excellent for fishing ledges, points, sandbars, and humps. The bed of a stream or river. The Osage River is the Main channel of Lake of the Ozarks. Topwater plug with a dished-out (concave or "cupped") head designed to make a splash when pulled sharply. Refers to the depth you are able to see an object (such as your lure) under the water. The Niangua arm of Lake of the Ozarks is normally the least clear. The dam area and the Gravois arm are normally the most clear. A weather condition accompanied by high, clear skies, and a sudden drop in temperature. The deepest position on structure where a bass angler can first effectively present his lure to bass as they migrate from deep water. Timing a sinking lure to determine when it will reach a specified depth. This is accomplished by finding the rate of sinking of a lure in feet-per-second. Often used when fishing for suspended fish. Natural or manmade objects on the Lake of the Ozarks that influence fish behavior. Anything a fish can use to conceal itself. Examples include stick-ups, tree lines, stumps, rocks, logs, pilings, docks. Do not confuse with structure. Typically, a lipped lure that dives under the surface during the retrieve. So-called lipless crankbaits are thin, minnow-like lures that sink at a rate of about 1-foot per second. Small fresh water crustaceans similar to lobsters only smaller. A favorite food of bass. This term also describes a reddish color used in many lure designs. Lake of the Ozarks is loaded with crawfish. Jigs are a very popular lure at Lake of the Ozarks to imitate the crawfish. A soft plastic bait with several appendages; most popular for flipping, pitching and Carolina rigging. A sonar device, either a flasher unit or LCR recorder, used to read the bottom structure, determine depth, and in some cases actually spot the fish; also called a fishfinder. A hook tied directly to the line from four-inches to four-feet above the sinker. The hook is attached from the back side or opposite the point, with a simple Palomar knot with a tag end about four or five feet long. The weight hangs and the hook is at a 90-degree angle to the line with the hook point up. The hook can be 18 to 24 inches above a bell sinker tied on with a slip-knot. A sudden change in depth, created by small creek channels, land points, ledges and the general lay of the land. Lake of the Ozarks has many bluffs with ledges. These are an example of excellent places to fish with drop-offs. Making several casts to cover an area surrounding by the angler. An angling technique characterized by the use of light tackle - line, rods, reel and artificial baits (often tube worms, grubs, or other small-sized soft-plastic lures); often productive in clear, fairly uncluttered water. An area in a body of water with little if any change in depth. Small and large, flats are generally surrounded on at least one side by deeper water, the bottom comes up to form a flat area where fish will often move up for feeding. Many flats are found in the back of larger coves at Lake of the Ozarks. The technique of placing a lure in a given spot precisely, and quietly, with as little disturbance of the water as possible using an underhand cast while controlling the line with your hand. Flipping behind and under docks is a very popular technique at Lake of the Ozarks. Small baitfish, crayfish and other creatures that bass eat. Gizzard shad, bluegill and crawfish are the main forage of bass at Lake of the Ozarks. Soft-plastic worm about 4 inches long. Resembles a crinkle-cut French fry. Used often on Carolina Rigs. Weather system that causes changes in temperature, cloud cover, precipitation, wind and barometric pressure. Electronic devices that use transmissions from an array of satellites to aid in navigation and to show precise position, usually on a chart or map. A short plastic worm used with a weighted jig hook. One who shows the way by leading, directing, or advising on how and where to catch Lake of the Ozarks bass. The service can be for a fun day fishing, pre fishing for a bass tournament, learning techniques, a relaxing day on the water, gaining knowledge and experience with a professional bass fisherman. Lake of the Ozarks guides are Jack Uxa with Jacks Guide Service and James Dill with James Dill Guide Service. Usually refers to a lunker-size or heavyweight bass weighing 4 pounds or more. Many hawgs are caught everyday on Lake of the Ozarks. The process by which the hook is driven into the mouth of a fish. The distance a fish moves while remaining at the same depth. An area higher than the surrounding area. A submerged island might be considered a hump. There are many humps at Lake of the Ozarks that hold fish year round. The branch of zoology that deals with fishes - their classification, structure, habits, and live history. Bass that are in a non-feeding mood. Jerkbaits resemble more of a minnow baitfish . The lure is fished by twitching or jerking the lure forward, hence the name. Many suspend at different depths depending on the type. 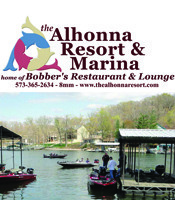 One of the most popular winter and early spring lures at Lake of the Ozarks. Popular brands are Mega-Bass, Smithwick, Lucky Craft. A leadhead poured around a hook and featuring a skirt of rubber, plastic, or hair. Another very popular lure at Lake of the Ozarks. Many tournamnets have been won using jigs. Crock-O-Gator is an excellent choice for Lake of the Ozark jigs. Combination of a leadhead jig and pork rind trailer; among the most effective baits for attracting trophy-size bass. A bass that conforms to a specific minimum length limit established by tournament organizations and/or state fisheries department. A shoreline tree that has fallen into the water. There are many laydowns in the Glaize and Niangua arms of Lake of the Ozarks. An edge of a flat or gently sloping bottom that is cut by any channel or other feature so as to create a sharp drop-off. Ledges on bluffs are an excellent choice to fish in summer and winter at Lake of the Ozarks. Restriction on the number of fish that an angler may harvest in a day. Rod rings through which fishing line is passed. Artificial baits designed to resemble a swimming baitfish. Such plugs vibrate and/or wobble during retrieve; some have built-in rattles. Excellent choice for long fan casting to cover a lot of water on Lake of the Ozarks flats. An aerated tank in boats used to hold fish in water until weigh-in time so that they have a better chance of survival when released. A group of horizontal logs pushed together by wind or water flow to form an obstruction. In lakes, logjams are usually found close to shore and in the backs of coves. After storms on Lake of the Ozarks the logjams will result of rising water levels. Slang term for large bass of any species. Lake of the Ozarks is loaded with lunkers. Many believe a bass over 4 pounds is considered a lunker. Match the hatch — mimicking the size and color of insects, baitfish or other prey. Scientific term for largemouth bass. The path followed by bass when moving from one area to another normally due to seasonal changes or spawning activity. Initials that stand for Personal Floatation Device; also called a life vest. A defined set of location and presentation factors that consistently produce fish. Water conditions such as depth, cover, structure, temperature, clarity, currents which attracts fish to a specific location. The act of a bass taking a slowly fished lure, such as a plastic worm, crawfish or lizard. Presentation technique in which worms or jigs are dropped into cover at close range with an underhand pendulum motion. A very popular technique used at Lake of the Ozarks around docks with jigs. The jigs are pitched between the black floats of the docks to get the lure under the docks. A molded soft plastic lure designed to imitate a worm. Plastic worms are manufactured in numerous sizes, shapes and colors. These are an excellent summer bait to use around docks and brush piles at Lake of the Ozarks. Many Wednesday Night Hawg Fight tournaments are won on plastic worms. A finger of land jutting into the water; deeper water is usually found just beyond the exposed tip and along the length of both sides. Fishing on and around points is often exceptionally rewarding. During post spawn at Lake of the Ozarks many large bass can be caught off main lake points when there is medium to heavy generation. The period following a cold front; atmosphere clears and becomes bright; usually characterized by strong winds and a significant drop in temperature. A collective term referring to choice of type of lure, color, and size; structure targeted; amount of disturbance a bait makes when entering the water; and retrieval technique, speed, and depth used to catch fish. Example: Pitching a jig between the floats under a dock. The period shortly before spawning begins when big bass typically invade shallow water and feed voraciously. Lures fished in a way that causes a bass to strike out of reflex or surprise; spinnerbaits, crankbaits and lipless crankbaits are frequently fished in a manner designed to generate reaction bites. Artificially created place where water is collected and stored; also called an impoundment. Lake of the Ozarks is a Reservoir lake. A man-made stretch of rocks or material of a hard composition that usually extend above and below the shoreline; Rip Rap can be found near many seawalls at Lake of the Ozarks. Rip Rap is also Ameren and the Corp. of Engineers preferred method to stabilizing a piece of shoreline. A group of bass or other fish congregated in a small area. During the winter at Lake of the Ozarks you can find bass schooled around bluffs, bluff ends and main lake points. A prolific baitfish that serves as the primary food fish for bass in reservoirs and rivers. At Lake of the Ozarks are gizzard shad. According to Greg Stoner, the biologist with Department of Conservation at Lake of the Ozarks, he has seen the gizzard shad on this lake as large as 18”. A special leadhead jig designed for rigging a worm weedless and used in the shaking technique. Crock-O-Gator baits offers the best shaky head. When a fish hits at a lure and misses it. Many times this happens with a Zara Spook, Pop-r and other topwater lures. Targeting bass that are visible to the angler. Many anglers at Lake of the Ozarks sight fish during the bass spawning season. A lead weight with a hole through the center. Threaded on line, a slip sinker slides freely up and down. The slip sinker is used in both Carolina and Texas rigging, 2 very popular techniques at Lake of the Ozarks. Spinnerbait presentation in which the lure is retrieved slowly through and over cover objects. An acronym for SOund, NAvigation and Ranging, the technology which makes depthfinders/fishfinders possible. At Lake of the Ozarks this is a must when locating baitfish, humps, points, channels transitions and water temperature. A manner of fishing employing a push-button, closed-face spinning reel and baitcasting rod; reel is mounted on topside of rod. A leadhead lure similar in shape to an open safety-pin with a hook; other features include a rubber, plastics, or hair skirt, and one or two blades of various shapes and sizes. The act of alarming a fish in a negative way. A large splash when your lure hits the water. Load trolling motor. Too much talking. Stump, limb, section of pipe, fence post - that extends above the surface; a favorite casting target of bass fishermen. Changes in the shape of the bottom of lakes, rivers, or impoundments, especially those that influence fish behavior. This is probably the most misunderstood word in bass fishing. Structure is a feature on the bottom of the lake. Some examples of structure at Lake of the Ozarks are creeks, humps, depressions, roadbeds, ledges, and drop-offs, points, flats. Any of a loose group of lures that emulate baitfish and are frequently characterized by their large size in relation to other bass lures; swimbaits may be soft or hard lures, lipped or not lipped and one piece or jointed. Angling equipment, excluding artificial baits, attached to the end of a fishing line; examples include hooks, snaps, swivels, snap-swivels, sinkers, floats, and plastic beads. The method of securing a hook to a soft-plastic bait - worm, lizard, crawfish, so that the hook is weedless. A slip sinker is threaded onto the line and then a hook is tied to the end of the line. The hook is then inserted into the head of a worm for about one-quarter of an inch and brought through until only the eye is still embedded in the worm. Fished frequently around docks at Lake of the Ozarks. Floating hard baits that create some degree of surface disturbance during retrieve. Exceptional lures to use early and lake in the day at Lake of the Ozarks. Many 5 pound and up bass are caught on topwater lures here. The extra hook, or cheater hook added to a single-hook lure, such as a spinnerbait or Crock-O-Gator buzzbait. The imaginary line where one type of bottom material changes to another. These transitions can be seen on your depth finer and occasionally by looking at the change in the bank or shoreline. Hook with single or bundled shaft and three points. Employment of any lure-retrieval technique or other fishing strategy that causes a bass to strike. A small electric fishing motor, typically mounted on the bow, that is used as secondary boat propulsion, for boat positioning, and to maneuver quietly in fishing areas. Any of a variety of soft plastic lures with a hollow cavity. The period when the cold water on the surface of a body of water descends and is replaced by warmer water from below. An array of four or more artificial lures or baits (with or without hooks) cast or trolled by a single rod and reel combination and attached by a wire or other harness; a popular trolling rig for striped bass and other pelagic species. This has become a very popular lure at Lake of the Ozarks. Used in late winter and early spring many large bass have been caught contributing to tournament wins or places. Up and down movement of fish. There are many variable why the bass will move up and down in the water column at Lake of the Ozarks. Water temperature, current created by generation, boat noise, feeding are a few examples. Retrieval technique by which the lure moves in a zigzag pattern — like a dog pulling back and forth on a leash; caused by twitching the rod tip and reeling simultaneously in a specific cadence. Topwater bait that catches huge bass. When the conditions are right at Lake of the Ozarks, cloudy days, early morning or after sunset, this lure will catch lunker bass. Refer to walking the dog as the technique used with the Zara Spook.